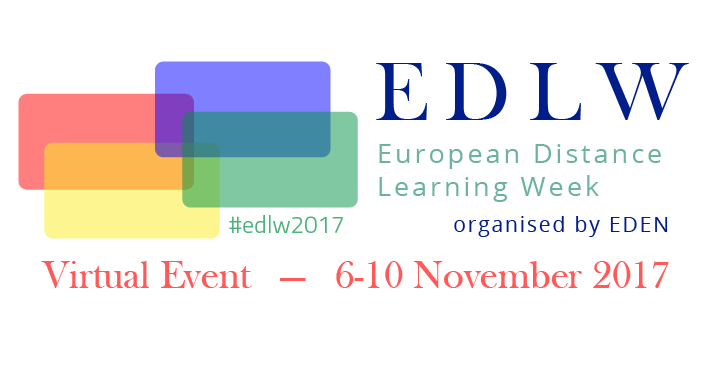 After a successful partnership between EDEN and USDLA in organizing National Distance Learning Week (NDLW) in the US in 2015, EDEN organised the first European Distance Learning Week (EDLW) in 2016, further expanding upon its collaboration with the US and other EDEN international partnerships. This year 5 webinars with 393 registered participants were held. The participants came from 44 different countries including 16 countries from outside Europe from Canada to Brazil, from South Africa to Nepal, encompassing all 4 continents (Europe, Asia, Africa, America) and demonstrating a strong geographical coverage and a substantial outreach. 153 participants eventually turned up. 31 facilitators contributed to the successful implementation of this initiative, among them representatives of the European Commission and the Lifelong Learning Platform. EDEN thanks the valuable contribution of the facilitators and hope that this initiative successfully contributed to the European dialog about the present state and the future of open and distance learning. All participants and facilitators receive EDEN open badges for their contribution.